NASA's Spitzer Space Telescope finds a delicate flower in the Ring Nebula, as shown in this image. 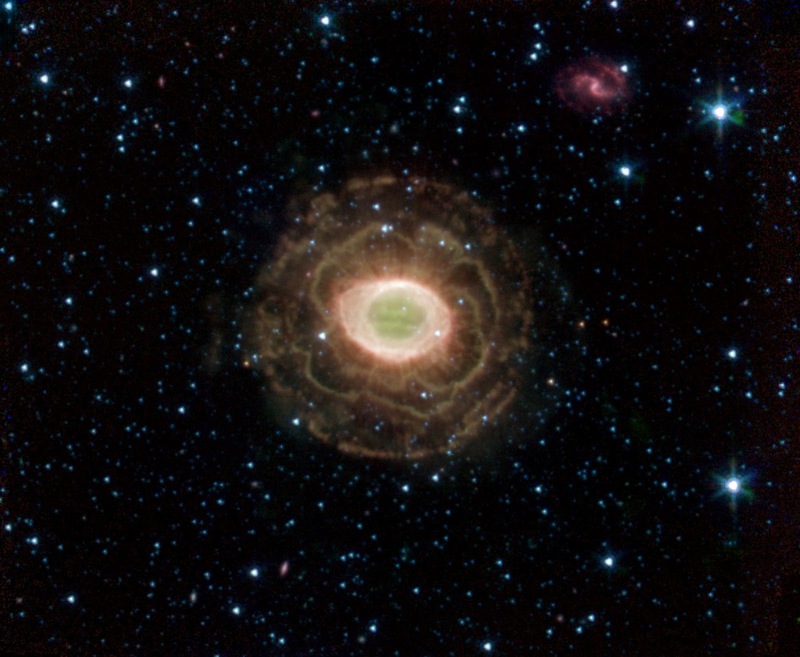 The outer shell of this planetary nebula looks surprisingly similar to the delicate petals of a camellia blossom. (A planetary nebula is a shell of material ejected from a dying star.) Located about 2,000 light years from Earth in the constellation Lyra, the Ring Nebula is also known as Messier Object 57 and NGC 6720. It is one of the best examples of a planetary nebula and a favorite target of amateur astronomers. The "ring" is a thick cylinder of glowing gas and dust around the doomed star. As the star begins to run out of fuel, its core becomes smaller and hotter, boiling off its outer layers. Spitzer's infrared array camera detected this material expelled from the withering star. Previous images of the Ring Nebula taken by visible-light telescopes usually showed just the inner glowing loop of gas around the star. The outer regions are especially prominent in this new image because Spitzer sees the infrared light from hydrogen molecules. The molecules emit the infrared light that they have absorbed ultraviolet radiation from the star or have been heated by the wind from the star.